Business-savvy individuals with a wide range of experience and expertise will find solutions and inspirations to tackle business challenges in each issue of Entrepreneur. From financial advice for start-up companies to success stories from millionaire business founders, readers will discover strategies and planning tips to smoothly start and manage a business. The magazine spans a wide range of business topics, which will appeal to inventors, risk-takers and those with entrepreneurial traits. Learn from successful entrepreneurs who share secrets of their success from the ground up. Find technology insight as it pertains to the business climate. Get advice about business culture, including relationships with customers and employees. Gain knowledge from financial experts. Read exciting and inspirational stories from likeminded small business founders. Readers will also find features dedicated to business travel, answer on tough ethics questions and other company issues, and several special editions throughout the year. 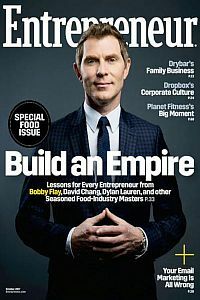 Business-minded professionals with an entrepreneurial spirit will love a subscription to Entrepreneur! Subscribe today for inspiration, strategy and expert advice on a variety of small business topics.